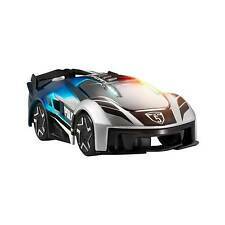 1 x new RASTAR Yellow Transformable Robot Car. Toy weapons must be removed before transforming from robot to car. Batteries: Car - 4 x AA (not included); Remote - 3 x AAA (not included). With another simple press he transforms back into a full powered car in just a few seconds after the robot speaks. Unique "free fall" take-off system allows Mambo to be hand launched. 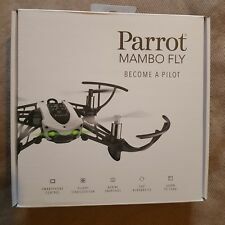 Write code for your drone through partner applications and marvel as Mambo executes your commands. Be the envy of your friends with this highly detailed replica Ferrari 458. Be the envy of your friends with the highly detailed New Bright RC Ferrari 1:24. To be used under the direct supervision of an adult. HUBSAN RED5 Q4 QUADCOPTER. 1 x Q4 Quadcopter. 1 x Q4 remote. Three sensitivity modes. Requires 2 x AAA batteries. 40 minutes. 100h 3.7 Li-Po battery. Technical Specifications. Box size 22 x 10 x 9 in. 7116234 GD. ALSO NOTE THERE MAYBE SMALL FINGERPRINT MARKS AND SMUDGES WHEN WE HAVE INSPECTED THE ITEM. United Kingdom. Kingston House. Drive around the Eleanor like you're in the popular 2000 movie,Gone in 60 Seconds ! 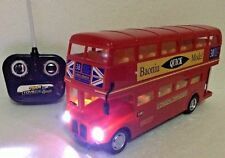 Requires 2 "AA" batteries for the remote and 4 "AA" batteries for the car, not included. Ages 14 and up. 1:24 R/C Full Function Predator truck. 4123024 GD. ALSO NOTE THERE MAYBE SMALL FINGERPRINT MARKS AND SMUDGES WHEN WE HAVE INSPECTED THE ITEM. For ages 3 years and over. Size H20, W13.8, L10.6cm. Batteries required: 5 x AA (NOT INCLUDED). Light up machine gun barrel when firing. Light up cannon barrel when firing. Real tank sounds. Toy weapons must be removed before transforming from robot to car. Batteries: Car - 4 x AA (not included); Remote - 3 x AAA (not included). With another simple press he transforms back into a full powered car in just a few seconds after the robot speaks. Zoom around on your own or race your friends. 5486478 GD. Full function to handle lunar landscapes. With 10 player racing. ALSO NOTE THERE MAYBE SMALL FINGERPRINT MARKS AND SMUDGES WHEN WE HAVE INSPECTED THE ITEM. 001154319110 GD. Get ready to race! • Auto Fly Technology: Launch, Hover, Land. • 2.4 GHz Transmitter. • Variable Flight Modes. • One Touch Stunts x 20. • Age range: Children 8 and up. • Protective ring, great for beginners. Color Black. Assembly Required No. Number of Puzzle Pieces 4. Material Care Instructions Do not wash with water use a damp cloth. Material Composition 95% plastic 4% aluminum. Material Type(s) Plastic. Air Hogs FPV High Speed Race Car with Headset and App radio control Condition is New. Dispatched with Royal Mail 1st Class. 3882380 GD. Fully functioning transmitter operation: drives forwards/backwards/left/right. Multiple engines provide 4x4 drive for super grip on all terrains. For ages 8 years and over. Batteries required: 1 x 6V (included). Model: WLtoys 24438. 1:24 scale original proportion: Accurate to every detail of the racing car, which making it much more real! Adopt high-quality PVC material, and good scratch resistance in characters. Own one of the world's most desirable cars with this scale Lamborghini Super Leggera. The radio control version of this luxury sports car provides hours of fun as well as turning heads with it's detailed and glossy finish. With a full direction remote this stylish car is ideal for kids, adults and collectors alike. Please note only one car on this frequency can be used. ---Batteries required: 5 x AA (not included) . ---For ages 6 years and over. ---EAN: 6930751301207. Feedback If you are satisfied with our service, pls. kindly leave us a positive feedback and give us the Detailed Seller Rating with all "5 stars" in very area. Your recognition will encourage us greatly and serve you better. Should a problem arise with your order, please contact us before leaving feedback. We strive to keep all our customers satisfy. It's all included in the Jeep itself. Fast 1 hour charging by plugging USB connector into any device. 3916610B GD. USB connector contained within the Jeep. For ages 8 years and over. Size H14.1, W18.3, L28.9cm. 4120845 GD. Be the envy of your friends with this highly detailed replica Ferrari 458. EAN: 050211024234. Batteries required: 5 x AA (NOT INCLUDED). For ages 3 years and over. Size H19.2, W9.8, L5.8cm. Collected over the last 35 years. collected ever since. iam a personal collector who grew up in the 70s and has. Supplied inside Cardboard box. It can even self-right itself if it tumbles over! Service Available. 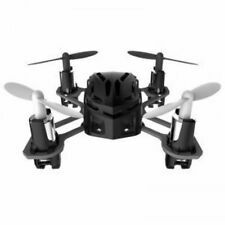 Spy Drone Quadcopter with Camera by MTECH. Dispatched with Royal Mail 1st Class. EAN: 6930751307681. It has an independent suspension system plus headlights and interior lights to add to the role play action. 2578956 GD. Press the rear window to turn on/off the headlight, rear light and interior light. Built-in 3.7V 100mAh Li-poly battery in Quadcopter. - Atom II Quadcopter. The specialized, lightweight construction of the Xtreem AtomII quadcopter will withstand impacts and crashes. It’s easy to get started. Inductrix Switch RTF Inductrix Switch RTF Inductrix Switch RTF Inductrix Switch RTF Inductrix Switch RTF Inductrix Switch RTF. One of the most unique products on the market, the Blade® Inductrix® Switch is truly the best of both worlds. 5637791 B3013. EAN: 050211066173. For ages 8 years and over. Li-Ion (included) AA (included). Size H31, W68, L37cm. One supplied. Over 60cm long. Great for outdoor play. All our reconditioned products may vary slightly and this is also reflected in the pricing. Most of our products have been opened to check that the item is complete and in working order. These include Northern Ireland, Isle of Man, Isle of Wight, Channel Islands and the Scottish Highlands and Islands. Toy weapons must be removed before transforming from robot to car. Batteries: Car - 4 x AA (not included); Remote - 3 x AAA (not included). BUILT IN GYRO FOR STABILITY! RANGE OF OVER 30M! A RED U8-S 2.4GHZ 3.5 CHANNEL HELICOPTER. USB CHARGING OF HELICOPTER. Own one of the world's most desirable cars with this scale Lamborghini Super Leggera. With a full direction remote this stylish car is ideal for kids, adults and collectors alike. Scale: 1:24. Batteries required: 5 x AA (not included).